OS grid reference: SN 7520 7910. The little hamlet of Ysbyty Cynfyn is located in The Valley of Afon Rheidol between Devil’s Bridge and Ponterwyd in the parish of Llanbadarn Fawr, and in the shadow of the Rheidol and Plynlimon Ranges, western Powys. 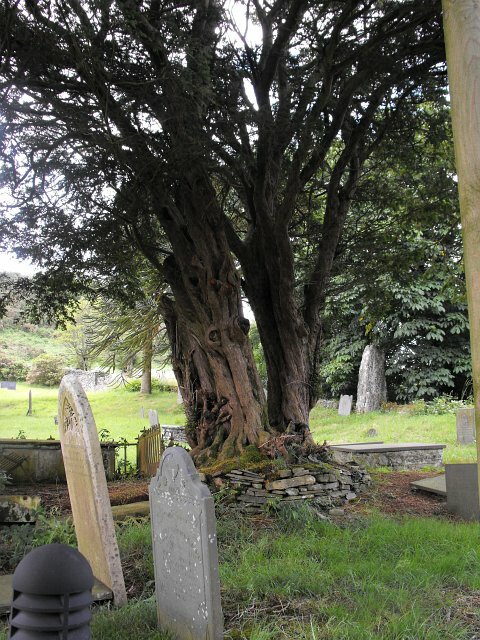 It is a 19th century church, but its sacred churchyard stands inside a prehistoric stone circle; the actual churchyard itself is partly circular which strongly suggests this is, and has been, a sacred site for thousands of years, and is often referred to by historians and antiquarians alike as Ysbyty Cynfyn Stone Circle. In the middle ages a monastic hospice run by the Knights Hospitallers of St John of Jerusalem stood on the site of the present-day church, which is dedicated to St John the Baptist, though there isn’t much to see of that today – but hence we still have the place-name “Ysbyty” meaning ‘hospittum’ (hospice). The hospice cared for pilgrims making their way to St David’s. This must undoubtedly be seen as a something of a compromise between the Christian Church and the pagan world of standing stones, temples, ritual and magic – something the church had wanted to banish, but here the two ‘quietly’ came together and so, we have a church within an actual pagan stone circle, even if there’s not a great deal to see, only five stones remaining, today. Or could it be that the stones were just too big to move so the churchyard wall was built around them! Aberystwyth is 12 miles to the west on the A44 and Devil’s Bridge is 2 miles south on the A4120 road. 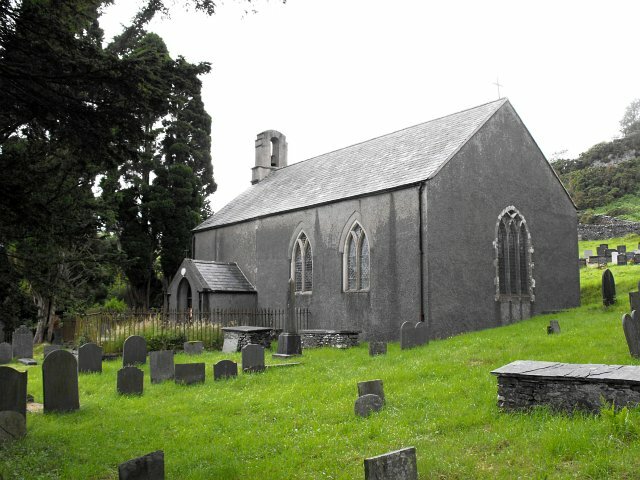 Ysbyty Cynfyn church is located about 80 metres west of the A4120 road, beside Temple farm. Today only five stones remain of the former circle set on a low earthen bank that is said to date from the Bronze-Age, around 1,500 BC; however the remaining stones seem to blend in well with the churchyard wall, indeed two thin slab-stones now act as gateposts at the eastern entrance and, there is at least one recorded account that says there is a faint ‘Christianised’ carving on one of these? 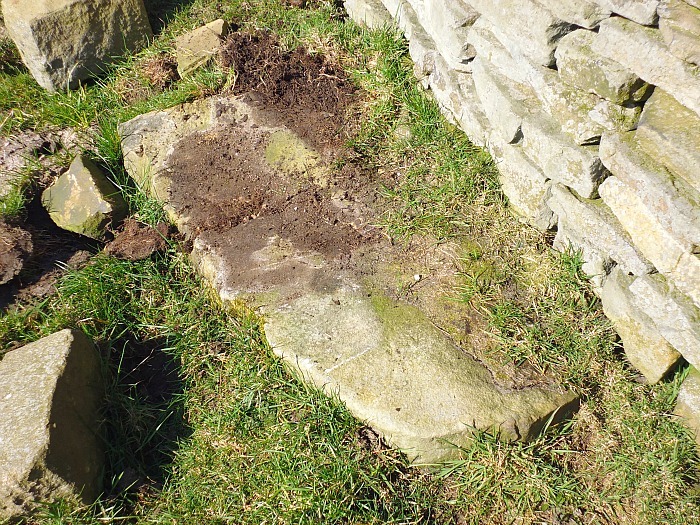 A large lump of quartz-stone on the top of the wall next to the gateposts looks interesting! The other two stones, also at the eastern-side, are very big in many ways both in height and girth, but whether they are in their originals positions is open to question? Two large, quite bulky standing stones fit ‘nicely’ into the wall surrounding the churchyard, while a third one stands at the back of the church (north-side) adjoining the wall and gravestones and is 3.4 metres (11 feet) high and about half as much in width; this particular stone would seem to be in its original position. Almost without a doubt there were other standing stones here long-ago, forming a proper circle, the site of what may have been, perhaps, a pagan temple used by druids for the purposes of ritual and magic. There are apparently a few ‘lost’ recumbant stones in the nearby fields – maybe these came from the stone circle? In the little church of St John there’s a curious carved wooden font (1850) and on the wall a brass plaque in memory of local men who fell in the 2nd world war. The church dates from 1827. Over by the carpark there is a round-shaped well with a ‘warning notice’ saying: “this water is not for drinking.” Could this well have been used by the knights of St John and did it once have healing properties? To the north of the church upon the Rheidol, opposite Bryn Bras, are the remains of an old lead mine that was called Temple Mine and, 1 mile to the west close to Parson’s Bridge, at Dolgamfa, a Bronze-Age cairn circle can be seen. Gregory, Donald., Country Churchyards In Wales, Gwasg Carreg Gwalch, Capel Garmon, Llanrwst, Gwynedd, Wales, 1991. Gregory, Donald., Wales Before 1066 – A Guide, Gwasg Carreg Gwalch, Llanrwst, Gwynedd, 1992. Houlder, Christopher., Wales: An Archaeological Guide, Faber & Faber, London, 1978. Photo Credit: © Copyright Penny Mayes and licensed for reuse under this Creative Commons Licence. Photo Credit:© Copyright Penny Mayes and licensed for reuse under this Creative Commons Licence. Categories: Stone Circle | Tags: St John the Baptist's Churchyard at Ysbyty Cynfyn in Wales, Ysbyty Cynfyn Stone Circle in Powys in Wales | Permalink. Ring Stones Hill Farm, near Catlow. OS grid reference: SD 8933 3670. On the tops above Nelson, Lancashire, to the east and about halfway between Delves Lane and the hamlet of Catlow there is a farm called Ring Stones Hill, where up until about 1856 there stood a large stone circle, or maybe a cairn circle, but sadly there is no trace of this ancient monument today – the stones having been robbed-away to build walls and some perhaps incorporated into the out buildings of the farm. Nothing much has been recorded about this prehistoric stone circle, only the name survives. However there may be stones belonging to this ‘now lost’ Bronze-Age monument in nearby walls, and one or two having being put into use as gateposts! 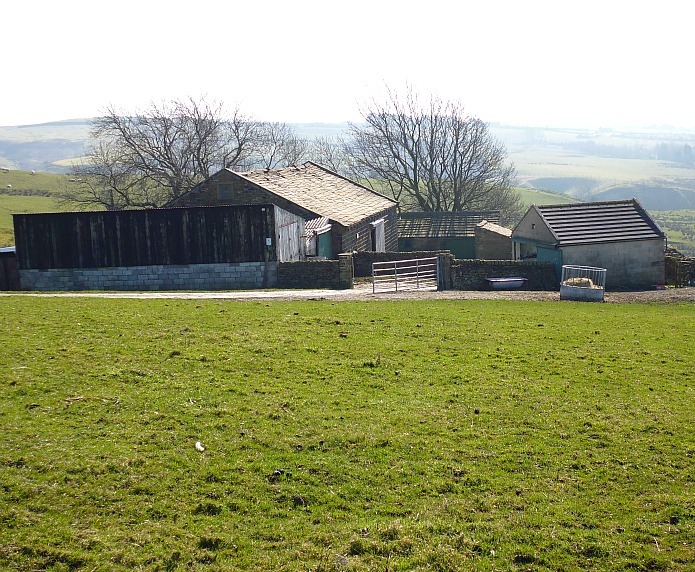 Ring Stones Hill Farm, whose barn is ‘thought’ to be built over the stone circle, is situated roughly between Delves lane and Crawshaw lane to the south-west of Knave Hill. 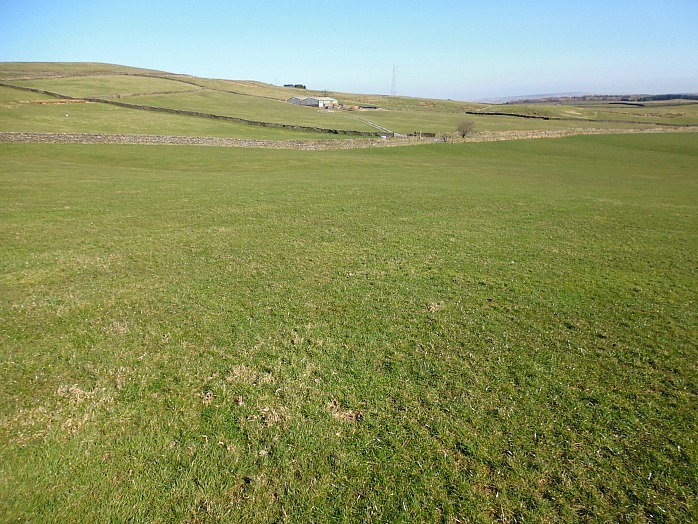 There is nothing to see, only fields, although on closer inspection there is a scattering of stones buried in the ground in a sort of circular fashion in the field just to the east, close to Pathole beck. Catlow is about half a mile from here along Crawshaw Lane, Walton Spire (Walton’s Monument) which is partly a Dark Age monolith, dating perhaps from the 10th century, stands just to the north, while the town of Nelson is 1 mile to the west. Recumbant Stone, near Ring Stones Hill. Site of burial mound near Ringstones Hill Farm. The origins of the name Catlow are somewhat confused. Cat could be an Old British word ‘catu’ meaning ‘war’ or ‘battle’, and similarly the Celtic word ‘catt’ also meams ‘battle’, whereas ‘low’ is usually taken to mean mound or henge; so here we have ‘battle at or near the henge’. And ‘cat’ might also refer to ‘feral cats,’ oddly enough! Over the years there have been a number of archaeological finds in and around Catlow Quarries and also in the vicinity of the ancient hamlet. In 1854 two decorated cremation urns were dug up by quarry workmen and, in 1845 a Bronze-Age tanged spear or dagger was excavated in Catlow, and in 1954 a third cremation urn was discovered to the south of the quarries; these were of the Pennine type that are called ‘collared’ urns, dating from the middle to late Bronze-Age. There have also been a few finds of Roman coins in this area and also at Caster-cliffe, about 1 mile north of Catlow. Categories: Stone Circle | Tags: Ring Stones Hill at Catlow near Nelson, Ring Stones Hill Stone Circle near Nelson in Lancashire | Permalink.